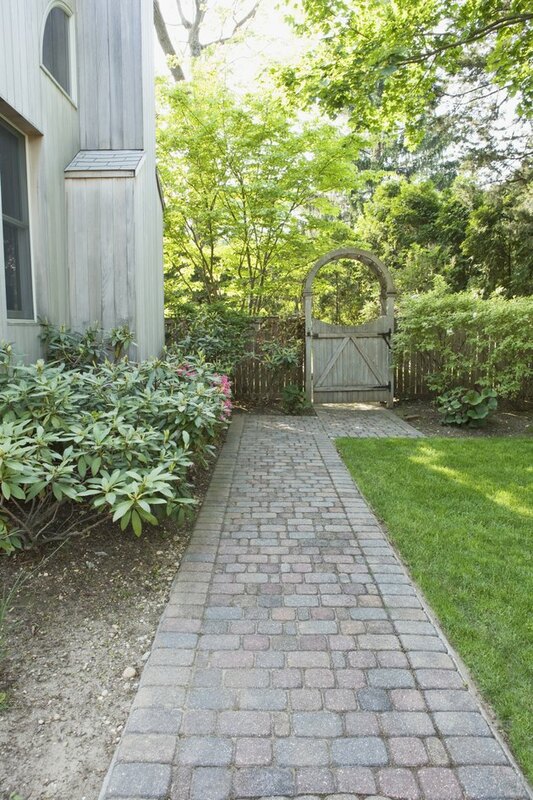 The purpose of a walkway is so you can walk from place to place without getting your feet wet, muddy or dirty. A flooded walkway is more than an inconvenience: it's a malfunctioning walkway. However, there's a way to dry up a flooded walkway without tearing it up or installing an entirely new walkway. Keep your feet dry by installing drainage near a flooded walkway. Observe the walkway immediately after a rainstorm. Continue observing the area as the water drains away. Locate the spot where the water remains standing on the surface the longest. This is the spot to install the drainage. Dig a hole with a post hole digger approximately 8 inches away from the edge of the walkway, near the spot where water stands the longest after a rainstorm. Make the hole about 24 to 36 inches deep and as wide as the drainage pipe. Add a shovelful of gravel to the bottom of the hole. Measure the depth of the hole with a yardstick. Cut a length of drainage pipe about 8 inches shorter than the depth of the hole, following the instructions of the drainage pipe manufacturer. Insert the drainage pipe into the fabric sleeve, which keeps soil from filling up and clogging the pipe, thereby making it ineffective for draining. Tie a knot in the fabric at the end of the pipe. Insert the covered drainage pipe vertically into the hole. Add shovelfuls of gravel on top of the drainpipe to fill up the rest of the hole with gravel.